The theme is "Create IP Culture - Open for Business", for which we will provide a number of timely, business-oriented sessions, giving you opportunities to share developments and insights on the latest in licensing and IP. We will have two brilliant Keynote Speakers, Mr. Toshiyuki Shiga, Member of the Board of Directors of Nissan Motor Co., Ltd., and Chairman and CEO, Member of the Board of INCJ, Ltd., and Mr. Satoru Matsuzaki, President and Representative Director, Ryohin Keikaku Co., Ltd. (MUJI). Registration is now open, so please visit our Conference website and register! Yokohama is the second largest city by population in Japan, with a population of over 3.74 million. Development of Yokohama began with the opening of its port to foreign trade in 1859. Yokohama will celebrate the 160th anniversary in 2019. 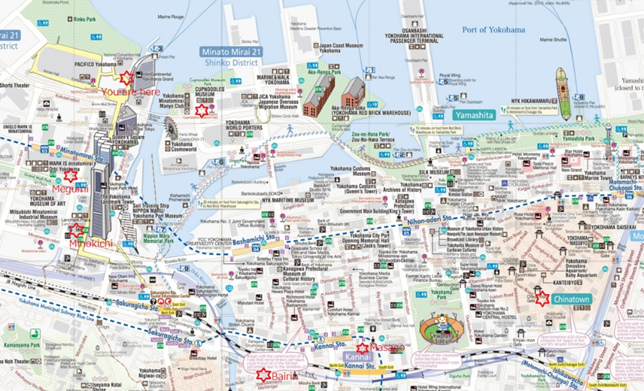 This article introduces some aspects of the developmental history of Yokohama. In 1853, the U.S. naval officer, Commodore Perry, came to Japan and demanded from the Tokugawa Shogunate, (the feudal military Japanese government in power since 1603), establishing a new trade relationship between the U.S. and Japan. Before then, the shogunate had a trading policy that limited foreign trade with western countries. In 1854, the shogunate finally signed a convention of peace and amity between the U.S. and Japan after several negotiation sessions with Commodore Perry, held in Yokohama.At the place where the negotiations were held, there is the Yokohama Archives of History exhibiting various historical materials. 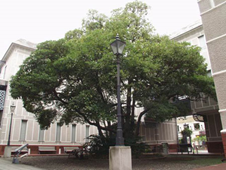 In its central courtyard, you can see an old tree, respectfully called “Tama-Kusu-no-Ki”, that actually welcomed the U.S. naval officers there in 1854. In 1858, the shogunate further signed a commercial treaty between the U.S. and Japan, followed by similar treaties with the U.K., France, the Netherlands and Russia. These treaties provided that 5 ports in Japan, Kanagawa, Nagasaki, Niigata, Hyogo and Hakodate, would be opened to foreign trade with the west. In 1859, the port of Yokohama was opened as the port of Kanagawa. However, Yokohama was a small village having only about 100 houses at that time. There were several reasons why Yokohama may have been selected. One reason may be that Yokohama was not too close to Edo (current Tokyo) where the shogunate was located. Another reason may be that Yokohama had good conditions for anchoring large ships. For example, the depth of the sea was large in Yokohama compared with other areas in Kanagawa. In addition, the mountains surrounding Yokohama blocked troublesome wind to the anchored ships. Raw silk was the largest export from the port of Yokohama. The ratio of raw silk in total exports was 65% in 1860 and increased to 86% in 1862. The raw silk exports were increased by 5.6 times in 5 years from 1860 to 1865. The drastic development of the raw silk trade in Yokohama was based on a combination of several factors. In Europe, there was a large demand for raw silk. However, the raw silk manufacturers in Europe were seriously damaged by a pandemic of silkworm disease in 1850s. In addition, China also had a difficult time, due to wars, for producing enough raw silk exports. On the other hand, in Japan, the technologies for manufacturing high quality raw silk had been developed during the Edo Era under the shogunate. This was especially true because of large demand of traditional textiles in Kyoto. Furthermore, the transport routs by land and water between Yokohama and the raw silk manufacturers in the northern areas were easily established after the opening of the port. These conditions were advantageous for the raw silk trade to occur Yokohama. The Silk Museum in Yokohama, which was built in 1959 for celebrating the 100 th anniversary of the opening of the port, provides visitors with various silk materials. The port of Yokohama was the entrance for new things from the world. In 1862, the first photo studio in Japan was opened in Yokohama. On May 9 th in 1869, the first ice cream in Japan was sold in Yokohama. Now every year, events for celebrating the anniversary of ice cream are held on May 9 th in several cities in Japan. In 1871, the first daily newspaper was published in Yokohama. In 1872, the first street gas lamps in Japan were installed in Yokohama. In the same year, the first railway in Japan was opened between Yokohama station (current Sakuragi-cho station) and Shinbashi station in Tokyo. 92 years later, the first Shinkansen was opened in 1964, just 9 days before the opening of Tokyo Olympics. In 1923, the Great Kanto earthquake struck Japan. Yokohama, having many landfills, was seriously damaged. The Yamashita Park was built in 1930 by using rubble from the earthquake. In 1945, at the end of the World War II, Yokohama was seriously damaged again, this time by bombing. While the recovery after the war was not easy, Yokohama reconstructed its infrastructure and developed its heavy and chemical industries in the coastal areas. In 1959, Yokohama Marine Tower, having a height of 106m, was built celebrating the 100th anniversary of the opening of the Yokohama port. Near the Yokohama Marine Tower, the retired Japanese cruise ship named “Hikawa-maru” is moored. The famous actor Sir Charles Chaplin enjoyed boarding the “Hikawa-maru” when he visited Japan in 1933. The Pacifico Yokohama, where the LES International annual conference in 2019 will be held, was built in 1991. The hotel, the conference center, and the exhibition hall of the Pacifico Yokohama were designed in the images of a sail, a seashell and waves, respectively. Yokohama Landmark Tower, having a height of 296m, was built in 1993. You can enjoy a nice view on the observation floor at a height of 273m. Nissan Stadium was built in 1998, where football games including the final of the 2002 FIFA World CupTM were held. Games of the Rugby World Cup 2019 TM will also be held at Nissan Stadium in 2019. As introduced above, Yokohama has developed to become the second largest city in Japan, beginning with the small village 160 years ago. We look forward to seeing the LESI members in Yokohama! Yokohama was a small fishing village but became the first point of contact with the world for Japan some 150 years ago. It is now a cultural hub and a gourmet town. Japan’s largest Chinatown is just three subway stops away from Minatomirai Station on the Minatomirai Line, at Motomachi-Chukagai Station. More than 250 Chinese shops and restaurants line the narrow, colorful streets, which are often very crowded on weekends. Try one of the many excellent small Chinese restaurants if you have a good local guide or are in an adventurous mood. Otherwise, a safer bet is large established restaurants such as Heichinro Yokohama Honten and Manchinro Honten that serve haute Chinese cuisine. Heichinro serves dim sum as well. Take the JR Yokohama Line four stops from Yokohama Station to Shin-Yokohama Station, and you will find the Shin-Yokohama Ramen Museum, which houses nine ramen noodle restaurants showcased in a streetscape of 1950s Tokyo. If you are a fan of ramen, this place is a must. Just a 7-minute walk from our LES venue, this museum commemorates Mr. Momofuku Ando, inventor of instant noodles (Chicken Ramen) in 1958 and Cup Noodles in 1971. You can sample noodles from around the world on the fourth floor and compose your own Cup Noodles to take home with you! Masago Saryo and Bairin are traditional Japanese restaurants. I recommend choosing one of the courses, and the server will note your dietary preferences so the chef can tailor the course. Dinners are 10,000 to 18,000 yen per person at Masago, which has two Michelin stars. Dinners at Bairin are 5,400 to 14,000 yen. These restaurants are very popular, so make reservations well in advance. Minokichi is in Landmark Plaza, a ten-minute walk through the shopping mall from our venue. Kyoto-style traditional courses are served, and there is a menu of good sakes and wines (preferable to the house wine). It also serves shabu-shabu (very thinly sliced Japanese beef cooked in a broth hotpot with vegetables). Dinner courses range from 7,000 to 16,000 yen. Reservations recommended. Megumi Fisheries is on the 4th floor of the MARK IS shopping mall next to Minatomirai Tower, about a 10-minute walk from our LES venue. You can have your fill of fresh sushi for 4,000 yen or less at this popular conveyor belt sushi restaurant. No reservations are taken. Fukusuke is a traditional sushi restaurant located on the 8th floor of the Yokohama Takashimaya Department Store near Yokohama Station. Dinners are 3,000 - 7,000 yen. This restaurant takes reservations. What to do? Contacting with "Japanese Traditional Culture"
“Grand Sumo Tounament”, “Kabuki”, “Bunraku” and “Tea-ceremony” are mentioned as typical Japanese Traditional culture. Sumo is Japan's national sport, which is like a wrestling. But there are no body weight restrictions nor classes, and therefore body weight gain is an essential for Sumo wrestlers. The May Tournament lasts 15 days from May 12, 2019 at Kokugikan in Tokyo. On the final day May 26, 2019 the play-off game will be conducted. The ticket for Japanese style box (sit on the floor) costs \38,000 or more, the ticket for an arena seat costs \3,800 or more (Official ticketing site: here). There is “Smo Museum ” on the first floor of Kokugikan (open 10:00 AM ～ 4:30 PM, closed on Saturdays, Sundays, National Holidays). For more information about Sumo please check here. Noh is a major form of classical Japanese musical drama that has been performed since the 14th century. Today the program generally includes two Noh plays and one kyōgen piece (comedic play), and the story is usually based on tales from traditional literature. Noh has very unique Performance elements, such as Masks, Stage, Costumes, Props, Chant and music. Do visit and see National Noh Theater (Tokyo), where you will be able to enjoy live performance of Noh and also Bunraku. Bunraku starts its history from the art of joruri in which a single person recites a story in collaboration with shamisen (similar as a guitar, but has three strings) music. Then it combined various performing arts and merged with the art of doll manipulation in around the 1600s. Bunraku stage has several structures used by performers and puppets. The performers consist of narrators, shamisen players, and puppeteers. You will be interested in what kind of tricks give life to the dolls and their dynamic movements by puppeteers. Together with Ginza-shopping, you may enjoy Noh at KANZE Noh Theater in GINZA SIX. Tea-ceremony (Chadō) has been held in Japan for over 1000 years, the tradition remains. The Tea-ceremony, also called the Way of Tea, is a Japanese cultural activity involving the ceremonial preparation and presentation of matcha, powdered green tea. Zen Buddhism was a primary influence in the development of the Tea-ceremony. There are two Tea gatherings, an informal “chakai” (a relatively simple course of hospitality including confections, thin tea, and a light meal) and a formal “chaji” (much more formal one, usually including a full-course kaiseki meal followed by confections, thick tea, and thin tea). A chaji can last up to four hours. The LES Japan has scheduled a day-trip to Kamakura as a post-conference tour of the 2019 LES International Conference in Yokohama. Kamakura is an ancient city filled with old temples and shrines. You might be interested in joining the tour to enjoy the scenery and atmosphere of the city. This article introduces parts of the history of Kamakura to help you decide your itinerary for the tour. Ancient Japan was a nation ruled by the nobles. In the 12th century, armed individuals arose to challenge local lords all over the nation. Those individuals gradually formed the class of Samurai or warriors. At that juncture, local lords were the foundation of aristocracy. The aristocratic government in Kyoto was eager to crush the riots. Minamoto Yoritomo (Lord Yori) was born in 1148 as the first son of a high-ranked Samurai family. His father led a riot against the Establishment but was killed during the battle. Lord Yori and his younger brother, Minamoto Yoshitsune (Tsune), were punished because of their father’s treason against the authority. Lord Yori was sent far away to Izu which was an uncivilized local district in the central part of Honshu, the main island. Tsune was also sent to a small temple located deep in the mountain of Kyoto. He read books and worked hard to be a good Samurai. Lord Yori grew up there as a leader of the Samurai and became known among neighboring districts. His fame grew bigger and bigger through battles and struggles with local lords. He finally had a chance to begin a feud with Heike, the most powerful family in Kyoto and western part of Honshu. For Lord Yori, Heike was the enemy and he wanted to destroy them in revenge for his father’s death. Tsune joined the battles with Heike and his performance was outstandingly remarkable. Many books wrote about his legendary performance during the conflicts. Despite his outstanding contribution, however, Tsune was not recognized for his bravery. Lord Yori envied Tsune and was concerned about his possible treason in the future. Knowing his brother’s envy, Tsune fled the districts under Lord Yori’s control. He sought a protection from the Fujiwara clan in Hiraizumi, 400 kilometer north of Kamakura. The founder of the Fujiwara clan warmly accepted him and instructed his sons and men to protect him. After the conquest of Heike, Lord Yori’s next target was the Fujiwara clan that had been enjoying independence in the north for over a century. Financially backed by the abundant production of gold in his districts, the Fujiwara clan constructed many temples and shrines. Some of them were comparable to those in Kyoto. One of them was the Golden Hall (Kon Jiki Do). The Golden Hall, after repeated repairs and reconstructions, remains in great condition even today. Lord Yori demanded that the Lord of the Fujiwara clan send Tsune back to Kamakura. His demand was ignored initially but, in the end, the Fujiwara clan decided to remove Tsune from Hiraizumi. Against the will of the founder, the Fujiwara clan killed Tsune and sent his head back to Kamakura with a letter of surrender. Lord Yori used the incident of Tsune’s killing as an excuse for the attack of Hiraizumi. He mobilized many large armies from the rest of the nation and led them to Hiraizumi. The Fujiwara clan were not able to resist. This meant the Fujiwara clan were no longer the ruling Lords. In Hiraizumi, Lord Yori was very impressed with mature culture in town. Temples and shrines were very prominent and statues and ornaments were colorfully decorated. Everything was new and exciting for Lord Yori. Upon return to Kamakura, he started to work on the development of his town and build temples and shrines there. In 1192, the Kamakura Shogunate was inaugurated, which was the first central government of the Samurai class in Japan. During his life, Lord Yori constructed three major buildings in Kamakura: Tsurugaoka Hachimangu Shrine, Sho-Chojuin Temple and Eifukuji Temple. The first one still remains (see, photo 1) but the last two no longer exist. Since it was burned in 1405, Eifukuji Temple has not been reconstructed. A history book tells that it was a two-storied big hall copying its counterpart in Hiraizumi. Recent scientific research revealed that the base stones and cornerstones buried in the site of Eifukuji Temple had the same dimensions in length and depth as those of the counterpart in Hiraizumi. 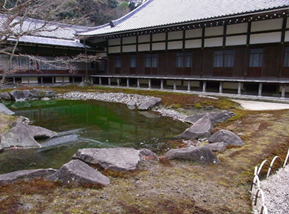 In addition to the building, its pond in the front yard was an exact copy of the pond of famous Motsuji Temple in Hiraizumi. Even now, the area in which Eifukuji Temple was build is called Nikaido which was named after the genuine hall in Hiraizumi. The government established by Lord Yori did not last long however. Political power gradually shifted to the hand of the Hojyo clan from which Lord Yori’s wife came. The Hojyo clan encouraged industrial development and expanded trade with China. Increased foreign trade resulted in the flow into the area of foreign commodities, Zen Buddhism and other things. Zen Buddhism was a form of mental discipline and became popular among the ordinary people. As Zen Buddhism became popular, the construction of Zen temples spread all over Kamakura. There are five well-known Zen Temples in Kamakura: Kenchoji Temple, Enkakuji Temple, Jufukuji Temple, Jyochiji Temple and Jyomyoji Temple. 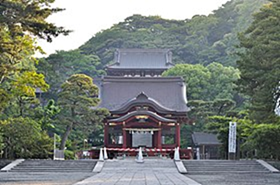 They are classed as highly important temples, and called Kamakura Gozan (temples in the five mountains) which were officially accredited and supported by the government. The Kamakura Gozan are often compared to their counterparts in Kyoto (Kyoto Gozan). In Kamakura and elsewhere, it is suggested you follow the etiquette of the temples and shrines. Here are some tips for visitors. 1) Go to worship in a quiet and respectful manner. Shrines and temples are regarded as sacred places where the God and Buddha are enshrined. They are not mere sightseeing spots. Before you enter the precincts of the building, you should have a little bow. Then you may go in to worship. 3) Kamakura has an 800-year history as the ancient capital of the Samurai. Consider the history when you are in front of the shrines and temples. You may learn something new when you think of the history of the area. 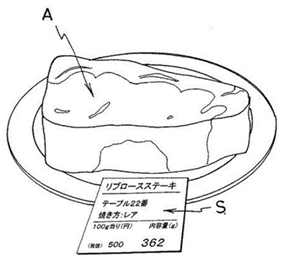 Is Serving a Steak Patentable in Japan? On October 17, 2018, the second division of the Intellectual Property High Court (IP High Court) presided by Judge Yoshiyuki Mori, found the following claim patentable. wherein the measuring device prints out a seal that describes the amount of the meat the measuring device has weighed and the table number described in the card, the marking is the seal that describes the amount of the slice the measuring device has weighed and the table number described on the card. The applicant is a Japanese company called Pepper Food Service Co., Ltd., which has restaurant chains under different brands in Japan and abroad. In 2013, it started a new service under the brand "Ikinari Steak," or "Suddenly Steak" in 2013. Although their restaurants now have some chairs, they started out as stand-up service only. It has more than 340 Ikinari restaurants in Japan and also nine in New York City. The originally filed claim 1 read: "A method for providing a steak comprising the steps of escorting a customer to a table for stand-up eating; inquiring the customer an amount of a steak; cutting a slice from a block of meat for the amount, grilling the cut slice, and bringing the grilled slice to the customer at the table. The examiner carried out a search and rejected this claim as being not patentable statutory invention, but cited no prior art. The applicant (or attorney) amended this claim changing it to a system and adding three product features: (1) "a card that has a number for the table to which the customer has been escorted," (2) "a measuring device for weighing the slice cut according to the customer's request," and (3) "a marking that distinguishes the slice cut in accordance with the customer's request from other customers' meat." Please note that no tying features exist among these. The examiner allowed the application. Patent No. 5946491 was registered. An opposition was subsequently filed and it was limited to the issue of patentable subject matter. The Japan Patent Office (JPO) allowed further narrowing amendments to the patented claim and invalidated the patent for not being a patentable invention. The applicant appealed before the IP High Court. The Court reversed the opposition decision for a clear departure from the current JPO practice. The case is now back before the JPO as it filed no appeal against the high court decision before the Supreme Court. The JPO may possibly do a fresh search ex officio for novelty and inventive step. According to the JPO guidelines, however, the examiners do not carry out a new search during the opposition proceedings. What the JPO will do next is to be seen. On November 5, 2018, the JPO published an outline of amendments to the Design Act asking for public comments. The outline included five major items: (1) protection of image designs, (2) protection of architectural and interior designs, (3) enhanced protection of related designs, (4) extension of term of design registrations, and (5) allowability of having multiple designs in one application. Previously, several attempts were made to provide protection under the Design Act over image designs, such as icons and platforms that are commonly used in different types of devices such as PCs, tablets, TVs and mobile phones. These attempts were met with very divided opinions among corporate leaders and were not fruitful despite that fact such protection is already available in many countries. Also, we do not have a well-established trade dress law for interior or exterior designs. Architectural and interior designs are currently not protected by the Design Act. Most likely, the amendments will be finalized after taking public comments and a bill will be introduced before the National Diet during the session that will start in January 2019, with reasonable expectation of passage by June 2019. On October 15, 2018, the JPO published a report summarizing the current status of the intellectual property dispute resolution system. This report is focused on amending the Patent Act and is seen as an attempt by the JPO to increase damages the court finds and make it easier to obtain evidence from the other party for stronger patent protection. The JPO solicited public comments until November 16, 2018. A comprehensive list of reform items including these were also discussed at the Intellectual Property Strategy Headquarters organized by the Prime Minister up until April 2017, but several industry leaders showed strong oppositions against it. Apparently, the JPO picked up more important items and gave an extra focus to discussions. Soon we should see a more definite course of reform of patent infringement litigation in Japan. Thank you for your support of “Winds from Japan.” This newsletter will continue to provide you with useful information on activities at LES Japan and up-to-date information on IP and licensing activities in Japan.